We’ve spent over 6 months riding a scooter in Bali, and we love it! It can be testing at times, but hitting the road and exploring on two wheels is one of our favourite ways of experiencing the island. Before renting and riding a scooter in Bali, read our 5 essential tips for a safe and enjoyable ride. Is riding a scooter in Bali a good idea? Riding a scooter in Bali is by far the quickest and easiest way of getting around. 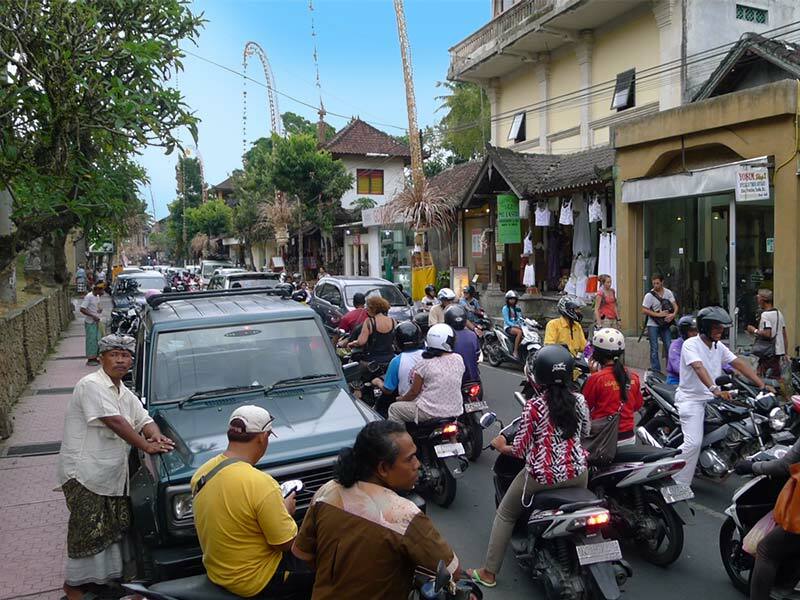 Bali’s roads can get very congested, especially in Kuta, Denpasar and Ubud, but on a scooter you can weave in and out of the traffic and take scenic backroads (or the occasional dirt track) to reach more remote parts. 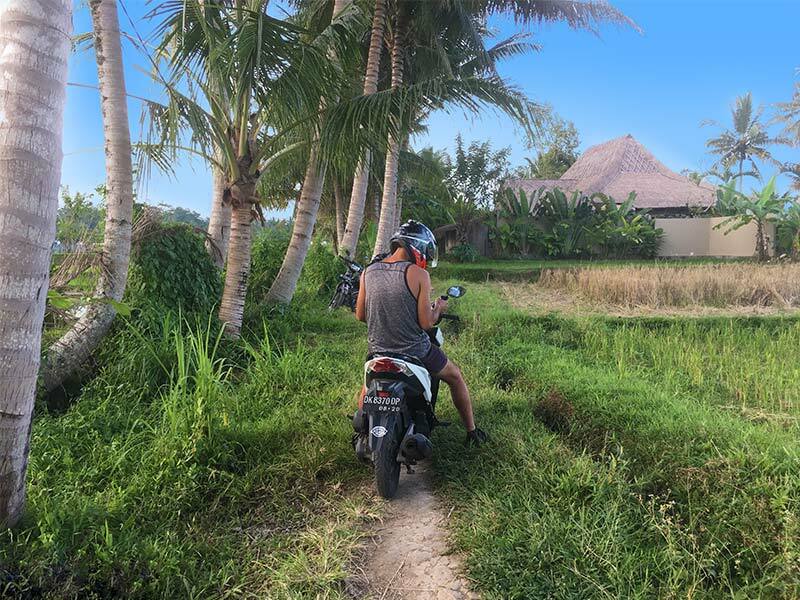 Touring Bali on a scooter is probably one of our favourite things to do here. Once you push through the traffic of more populated areas, the roads are beautiful and endless. Exploring the islands hidden gems, culture and scenery on the back of a scooter is an awesome experience not to be missed! We’re not going to lie, there is a lot that can go wrong while riding a scooter in Bali. Collisions, accidents, flat tyres and getting lost are all very real possibilities. 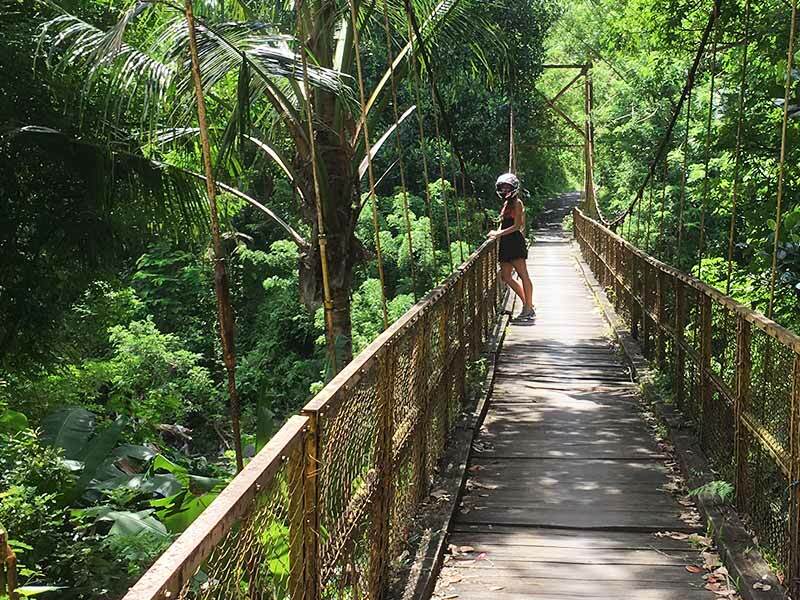 Imagine dodging potholes, ceremonial parades, piles of gravel, dogs, chickens, an entire family on a bike, wobbly restaurants on wheels, oncoming traffic in your lane, people who don’t indicate or discovering your homestay is off-road through the jungle, you never know what’s around the corner. Expect the unexpected and stay alert while riding a scooter in Bali – this is your number one priority! Can I ride a scooter in Bali and what do I need? So, do you need an international driver’s license for riding a scooter in Bali? If you’re travelling to Bali or South East Asia and would like ride a scooter during your trip, you should apply for an IDP (international driving permit) before leaving home. This will allow you to drive a private vehicle by law, in any country that recognises IDP’s, which Indonesia does. These are quick and easy to obtain in the UK from the Post Office and only cost around £6.00. The International Drivers Permit must be accompanied by a regular driving license issued in your country of residence for it to be valid. While it is still possible to rent a scooter in Bali without these documents (they will rarely be asked for) if you get pulled over by the police or have an accident this might land you in trouble, for example your insurance coverage may be invalid. We strongly advise keeping your IDP plus your standard driving licence with you at all times. Usually if you rent a scooter in Bali, it will not come with insurance. If you have a collision with another vehicle, this is normally settled up between the party and yourself. It is highly unlikely that your scooter rental company will help deal with any accidents or insurance queries. Check with your personal travel insurance provider to find out what is covered. For example, you may only be insured to ride a motorbike with an engine of up to 125cc. It’s also important to find out whether your insurance covers any passengers. If you know that you are likely to rent a motorbike or scooter in Bali, my advice is to get at least some basic training in your own country first. I didn’t have a great deal of experience on motorbikes and had never ridden a scooter before. However, just before travelling I did a basic motorcycle test and a few intense training days. This gave me that little bit more confidence to get going. It probably helped that I have many years of experience driving a car in London, which also involves a lot of concentration. How much does it cost to rent a scooter in Bali? Pertamina is the main gas supplier in Indonesia and is the equivalent to Shell or Esso back home. Pertamina gas stations can generally be found in larger villages and towns and along main roads. This is where we recommend getting your gas from as it is the cheapest place to fill up, plus you can guarantee the quality. All Balinese villages have at least one small roadside fuel stand. These are red and blue stands labelled Bensin or Pertamax, usually located outside of a shopfront or Warung. There is normally two types of fuel available; a yellow liquid (Bensin) or the blue one (Pertamax). Pertamax is slightly more expensive but better quality fuel. These are perfect if you get caught out and can’t find a Pertamina Gas Station. Although be prepared to pay a premium, since they are hand-pumped by the shop owner. Outside local shopfronts or small Warungs you will often find shelves filled with bottles of fuel. Save this option for emergencies only since the quality is questionable and often watered down. It’s also really expensive. What type of scooter should I rent in Bali? There are many different scooters to choose from in Bali. The cheapest and most common is the Scoopy, a small and slow bike perfect for a single person taking short journeys and tootling around the backstreets of Ubud for example. If you’re looking for something with a bit more power and a better fit for two people, then a Vario 150cc is a good option. These bikes are easy to get hold of in Bali and will be more appropriate for travelling long distances. It’ll make climbing those steep roads to the waterfalls a heck of a lot easier! After trying all of the above, our go-to bike is now the Yamaha NMAX. It’s a larger, more comfortable scooter with ABS Breaks, ample storage space, chunkier wheels and a 155cc engine. It is perfect for long journeys (especially if you travel with backpacks like we do), is more stable on the road than the smaller scooters, plus the extra power helps with going up mountains. Where can I rent a scooter in Bali? You won’t find it difficult renting a scooter in Bali. Usually the easiest way is to arrange a scooter rental via your accommodation, in fact your host or hotel will probably offer as they may already have one available for you to use. However we personally recommend renting from dedicated scooter / bike rental shops. This method often works out better if you need a long-term rental, plus you will have a bigger choice of scooters. By shopping around independently you can negotiate a price on your own terms, and choose a more specific bike. Our preference is 493 Scooter Rental in Kuta, which is a family-run business. They are honest, friendly and reliable – and most importantly they take great care of their bikes. We are currently renting a brand new Yamaha NMAX from them which we’ve had for 3 months with no problems. It is now possible to arrange scooter rentals online in Bali. 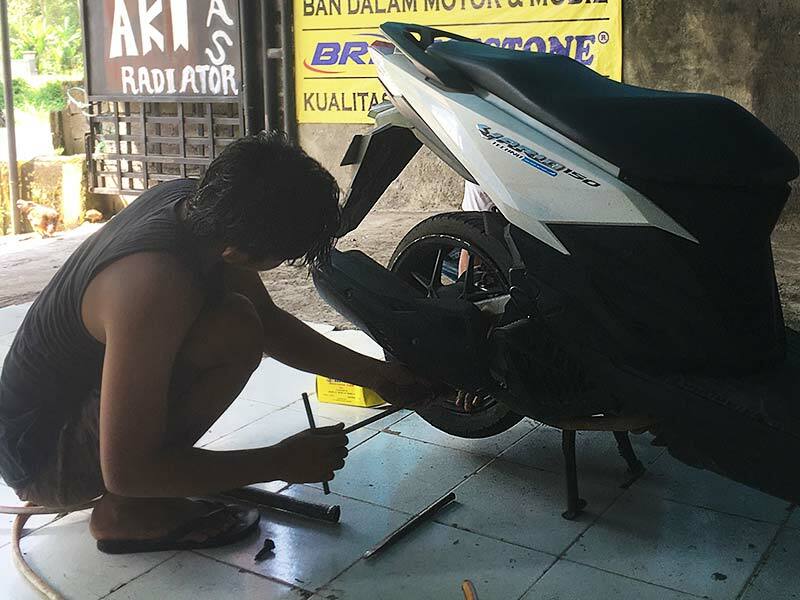 Some shops offer a free drop off / pick up service, so your bike can be ready and waiting for you at the airport or your accomodation for when you arrive into Bali. We cannot stress how important it is to wear a helmet while riding a scooter in Bali. After renting our first bike in Ubud, we were both given very ill-fitting helmets (Claire’s didn’t even stay on her head) so we decided to invest in our own. We opted for full face helmets which offer the best protection. These were purchased at the Bali Helmet Gallery in Denpasar for around 475k IDR each. The Bali Helmet Gallery has lots of helmets to choose from in a large air conditioned showroom, so you can try on more comfortably! Top tip – Although crime isn’t a big deal in Bali we avoid leaving our helmets unattended on the scooter because they are a bit nicer than the average! As the designated driver, I wear trainers while riding the scooter for better control and protection. We see many tourists going barefoot or wearing skimpy flip flops, but losing the skin from the bottom of your feet could easily happen, and would be completely debilitating if it did. Getting caught in a torrential downpour on a scooter is not much fun, but it is a common occurrence during rainy season in Bali. Pack a couple of ponchos or rain jackets in your boot just in case. It’s easy to catch the sun and burn while riding a scooter in Bali. Make sure to lather up before leaving the house. We use a phone holder attached to our scooter so that we can use google maps and navigate our way around the island with ease. These can be purchased at most phone shops in Bali, although you may need a garage to fix it onto your bike. If you get pulled over by the police, cooperate. Smile, be nice and humour them. Initially they will ask you a few standard questions and want see your license and bike registration documents. They may try scaring you by threatening a big fine or having to go to court, but this is usually all part of the act (I’m sure they love seeing tourists squirm!). If you have the correct documents and didn’t really do anything wrong then they will eventually ask you to pay some money. Don’t let them see your wallet or wads of cash. This is why its best to keep a few spare notes in your pocket and say thats all you have. From our experience the police were very nice (typical Balinese friendliness) they are probably just a bit bored and using you to pass the time. As long as you have everything in order and keep your cool, you’ll be on your way in no time. Top tip – The most common reason for being pulled over by the police is for not wearing a helmet. Be smart, wear one! Indonesians drive on the left hand side (yay for the Brits!) so always remember to keep left. Apart from that, there aren’t really any rules of the road. 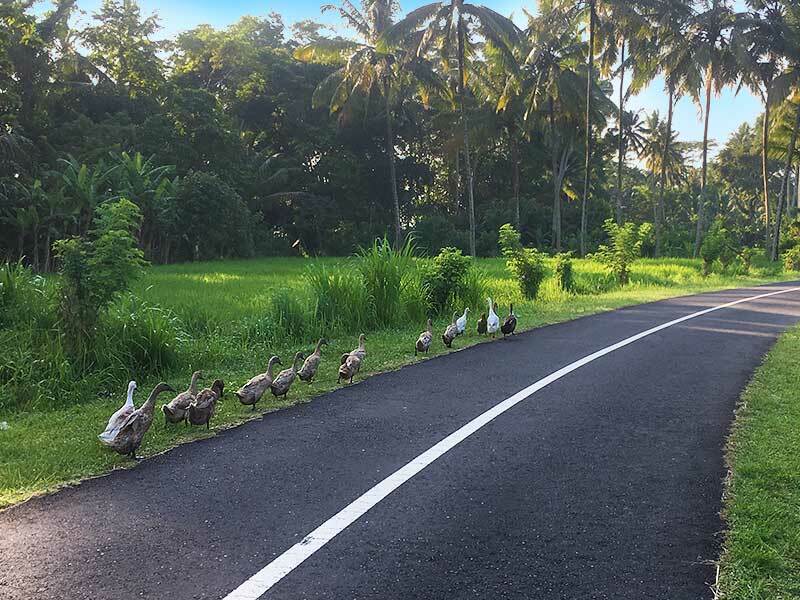 You will soon notice that there is a constant flow of traffic in Bali and everybody keeps moving (even if its ‘slowly slowly’) so just go with it. Try to avoid breaking and stopping too much. When you reach a junction, stay close to other scooters and all move together. Negotiating Bali’s roads for the first time will be a daunting prospect, but the best way to face them is with confidence. Letting your nerves take over will only cause grief as you’ll likely lose your balance or have an accident. Watch the way the locals drive and you’ll soon discover that magical flow of traffic. Now you’re all set to go! We hope you found our guide to riding a scooter in Bali helpful. Please share your experiences, we’d love to hear your stories in the comments below! Hubbie and I (Aussies) are going to spend 4 weeks exploring the whole island of Bali by bike in August this year. Super excited – thanks for the great tips. Was actually thinking of buying our own helmets before we head off and we will do that now! Previous experiences have confirmed the helmets provided with some of the bikes are not great! Thanks for your comment Carole! Glad you’ve found our tips helpful. A bike tour is definitely the best way of exploring and experiencing Bali 🙂 Yes, as long as you have a local SIM card. We recommend using Telkomsel which offers the best overall coverage.